Home > Blogs > So Just Who is Lonhro? So Just Who is Lonhro? "He is a freak," said rival jockey Jim Cassidy after Lonhro (AUS) (TrueNicks,SRO) rolled past his mount Grand Armee in the 2003 George Main Stakes (gr. I, 1 mile, video below). "That is the first time ever I've heard the whoosh as a horse goes past me. He burnt my ears. I let down and he let down five more gears. I'm stunned." Lonhro was an exceptionally talented racehorse. That day in the George Main, he clocked just over 21 seconds for the final quarter-mile, and shaded :10 2/5 in the final furlong. In all, he collected 11 group I's and was named Australian Horse of the Year and champion miler in 2003-04. He solidified the championship with a remarkable stretch run in the 2004 Australian Cup (gr. I, 10 furlongs, video below). Lonhro is by Octagonal, Australian champion 2-year-old in 1995, and champion 3-year-old and Horse of the Year the following season. A son of champion sire Zabeel, Octagonal is out of Australia's great blue hen mare Eight Carat, dam of five group I winners, and through her daughters ancestress of at least seven more. Lonhro's dam is the group III winner and multiple group I-placed Shadea, by the Mr. Prospector stallion Straight Strike. Shadea is from the family of top New Zealand sire Grosvenor and also produced Lonhro's three-time group I-winning full brother Niello. 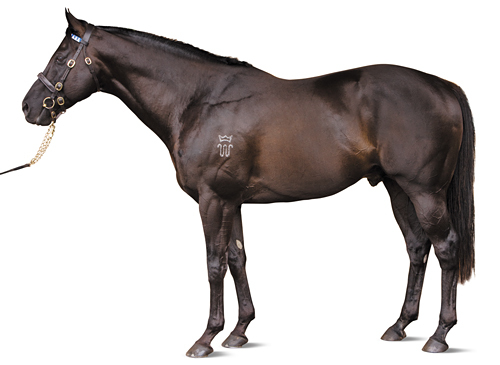 At stud, Lonhro was recently crowned leading sire for the 2010-11 racing season. He has sired three group I winners in Beaded, Benfica, and Denman, with most of his offspring excelling from six furlongs to a mile. Last week, Darley announced Lonhro would reverse shuttle to Kentucky for the 2012 Northern Hemisphere season, creating an exciting test for the champion sire—can he combine favorably with the Kentucky broodmare population? Helpful to Lonhro's success in Australia has been his appreciation for mares by Danehill (TrueNicks A), getting grade I winner Beaded and three other stakes winners. Danehill, a prolific international sire, boasts a very American pedigree, and his combination of Danzig/His Majesty/Buckpasser will offer some encouragement to Kentucky breeders. Lonhro would seem well-suited to other Danzig-line mares, and also has a stakes winner out of a Fusaichi Pegasus (TrueNicks,SRO) mare and a group III-placed runner from a Storm Cat mare. It will certainly be interesting to see what affinities develop once Lonhro's first North American crop hits the track in 2015.